This was what our little boy had for breakfast at Golden Pine Hotel in Baguio when we went there last month. Our son loves sausage, so this was perfect for him. He also had an easy time eating the sausages because they were served in bite-sized pieces. The addition of sautéed onions and bell peppers made the plate more interesting and the sausages more palatable. He ate all the sausages, but not all of the pancakes because he said he was already full. He was actually in a hurry to leave the hotel to see more of Baguio. Lol! 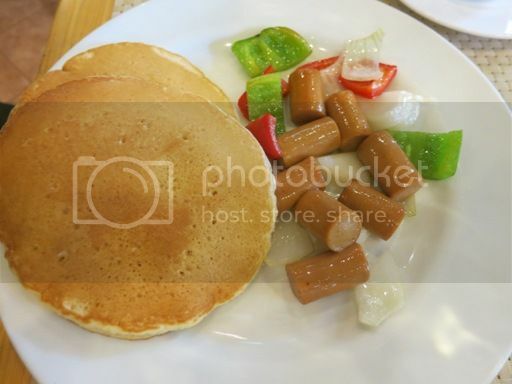 This entry was posted in Baguio, Breakfast, Golden Pine Hotel, Kiddie Breakfast. Bookmark the permalink. What an interetsing combination, techa!